Since Bryan Singer's X-Men redefined the superhero movie genre in 2000, Marvel's mutant franchise has done it all. It's been great (X2: X-Men United), it's been horrible (X-Men Origins: Wolverine), it's been surprisingly fun (X-Men: Days of Future Past) and it's been delightfully filthy (Deadpool). 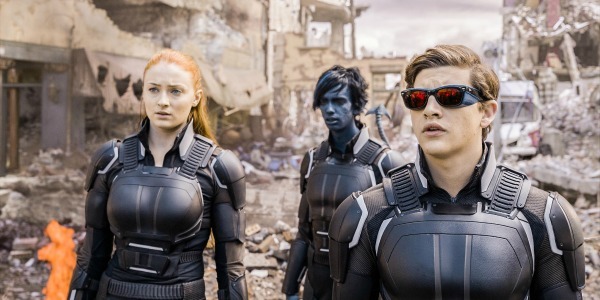 With X-Men: Apocalypse, Singer gives us an experience that's something else entirely: It's a goofy and passably entertaining way to spend two hours and 27 minutes. The flick is set in the 1980s after the events of Days of Future Past, which gave us an alternate timeline in which Mystique (Jennifer Lawrence) is a hero to mutantkind while Magneto (Michael Fassbender) has gone into hiding in Poland, where he has started a family. The emergence of an ancient mutant named En Sabah Nur, a.k.a. Apocalypse (Oscar Isaac) sets into motion events that lead to the creation of a new X-Men team that must combat Apocalypse and his Four Horsemen, saving humans and mutants alike. Joining the returning Mystique, Professor Xavier (James McAvoy), Quicksilver (Evan Peters) and Beast (Nicholas Hoult) are Jean Grey (Sophie Turner), Cyclops (Tye Sheridan) and Nightcrawler (Kodi Smit-McPhee), all of whom play characters that appeared in the original X-Men trilogy. They're in their teens in this movie, evidently, and if you try to do the math on these characters' ages in this series or how any of this makes sense chronologically, your brain might start feeling like you just went four hours in Cerebro. The bizarre thing about the X-Men franchise is that it's obsessed with filling in blanks, streamlining its continuity and attempting to fix inconsistencies on the fly (Days of Future Past did a lot of this). The problem is, the series isn't very good at any of that. Just how old is Mystique, anyway? If she and Xavier grew up as brother and sister, why do they seemingly not know each other in the original movies? Why does Xavier claim that Magneto helped him build Cerebro when it's already built by the time they meet? Why are there two Emma Frosts and two Trasks? We're asked to be invested in this mythology, which has been building for nearly two decades onscreen, but filmmakers, including Singer, can't even be bothered to fact-check their own work. That's probably why Singer wants us all to pull an Elsa with regard to continuity, urging us to "let it go." This isn't just an issue of filmmakers choosing to handwave the "bad" movies in the series, either. For example, in X-Men: First Class, Wolverine says "Go f*** yourself" when Xavier attempts to recruit him, but in that film's sequel, he quotes Logan as saying, "f*** off." That's so easy to get right! Just watch the last movie and take notes! Perhaps that's why Deadpool is the most successful X-movie yet: It acknowledged that these movies are pretty much a mess at this point. But a mess can be a lot of fun to watch, and I thoroughly enjoyed much of what Apocalypse had to offer. Quicksilver gives us another amazing "slow-motion" scene, there's an unexpected diversion involving the Weapon X program (and an obligatory cameo from You Know Who) and the final battle is a total blast. Whether you'll care about what happened 20 minutes after the end credits is another story entirely, but you probably won't regret the time you spent with these characters. It's nowhere near as good as Captain America: Civil War, but you also shouldn't expect it to be. Judging the movie on its own merits, though, there are some issues unrelated to my obsession with franchise continuity. Based on her performance, Lawrence doesn't seem to be all that interested in playing Mystique anymore, which is unfortunate since she's basically the protagonist of this new wave of X-Men movies. Equally unfortunate is the execution of Apocalypse and his Four Horsemen. Isaac does just fine with the material, but I could never shake the feeling that I was watching Ivan Ooze from Might Morphin' Power Rangers: The Movie, still hatin' on super-powered teenagers. This version of Apocalypse just isn't menacing, and the character design has a lot to do with it. As for his henchpeople, I feel like these new versions of Psylocke (Olivia Munn), Storm (Alexandra Shipp) and Angel (Ben Hardy), were pretty much wasted here. Maybe they'll have more to do in the next film, which will position them all as Xavier's former college roommates and longtime friends. Because consistency is for dweebs, after all. Dengar's feeling a tad left out, but if you dig on bounty hunters and you're a Smuggler's Bounty subscriber, you're happier than Jabba the Hutt during his cheat meal. Speaking of The Almighty Jabba, his palace will be the theme for the next Smuggler's Bounty box. To get in on this Funko fun, click here. After the depressing Batman v Superman: Dawn of Justice, I admittedly approached 2016's second hero vs. hero comic book flick, Captain America: Civil War, with some degree of caution. Sure, it's helmed by Anthony and Joe Russo, who also directed the spectacular Captain America: The Winter Soldier, and sure, it features Spider-Man's debut in the Marvel Cinematic Universe, but how could a movie that pits Earth's Mightiest Heroes against each other be any fun at all? The comic book by Mark Millar, upon which this film is loosely based, certainly doesn't have the trappings of an escapist adventure. At its core, this a story about the shattering of longtime friendships, the crossing of moral boundaries and the dangers of Big Government. So why did I have a stupid smile on my face from beginning to end? Somehow, the Russo brothers have transformed what could have and probably should have been a very bleak narrative into one of the most exciting Marvel movies to date, even as it puts our characters in a precarious position for future installments in the expansive MCU. This third Captain America film (and 13th in this movie universe), is set one year after the events of Avengers: Age of Ultron, and leaders of the world are none too pleased about the Avengers' lack of government oversight. The United Nations seeks to pass legislature known as the Sokovia Accords, which would force the superhero team to report to a UN panel. Tony Stark (Robert Downey Jr.) sees the value in accountability, while Steve Rogers (Chris Evans) does not. 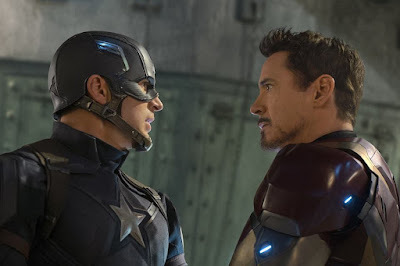 With Iron Man and Captain America unable to see eye-to-eye, battle lines are drawn, sides are chosen and the Avengers are divided. Returning from previous films are Hawkeye (Jeremy Renner), Scarlet Witch (Elizabeth Olsen), Vision (Paul Bettany), Falcon (Anthony Mackie), Black Widow (Scarlett Johansson) Ant-Man (Paul Rudd), Agent 13 (Emily VanCamp) War Machine (Don Cheadle) and Winter Soldier (Sebastian Stan), whose past life as Hydra's secret weapon continues to haunt him throughout the film. M.I.A. during all of this hero-on-hero action are Thor (Chris Hemsworth) and Hulk (Mark Ruffalo), although their whereabouts will likely be explored in Thor: Ragnarok, due in theaters next year. That hero deficit is more than rectified, however, with the introduction of Black Panther (Chadwick Boseman) and Spider-Man (Tom Holland). Boseman's T'Challa is a pure badass, bringing to life a complicated character that I never thought I'd see in a live-action movie. Holland's Peter Parker, meanwhile, puts a fresh spin (ha) on a character we've seen in five other films already, but he just might be the best and most comic-accurate version of the Wall-Crawler to date. This version of Parker never seems to shut up, especially during the film's big fight scene, and the way he annoys other heroes on the battlefield gives us the smartass (and sometimes accidentally insulting) Spidey we've never really seen on the big screen. I can't wait to see more of this iteration of the character in Spider-Man: Homecoming, where Stark will no doubt continue to horn in on Peter's Aunt May (Marisa Tomei). There's a lot of "gee-whiz" action on display in Civil War (just wait 'til you see what Ant-Man can do now) but by the end of the film's tense climax, characters' lives are forever altered, at least one beloved MCU character goes to the Great Beyond and relationships are irrevocably tarnished. Despite its somber moments, though, the film doesn't wallow in darkness, nor does it betray the moral foundations of its characters, even when they're at each other's throats. I sincerely hope Batman v Superman director Zack Snyder takes in a screening at some point. It's hyperbolic to say that Civil War is the best Marvel Studios movie yet, but it also might be true. It's vastly superior to last year's uneven Age of Ultron, and it's right up there with the original Avengers, Guardians of the Galaxy and The Winter Soldier in its combination of spectacle, humor and character growth. Go see it, and if you wind up with a stupid smile like I did, don't worry. That's supposed to happen.